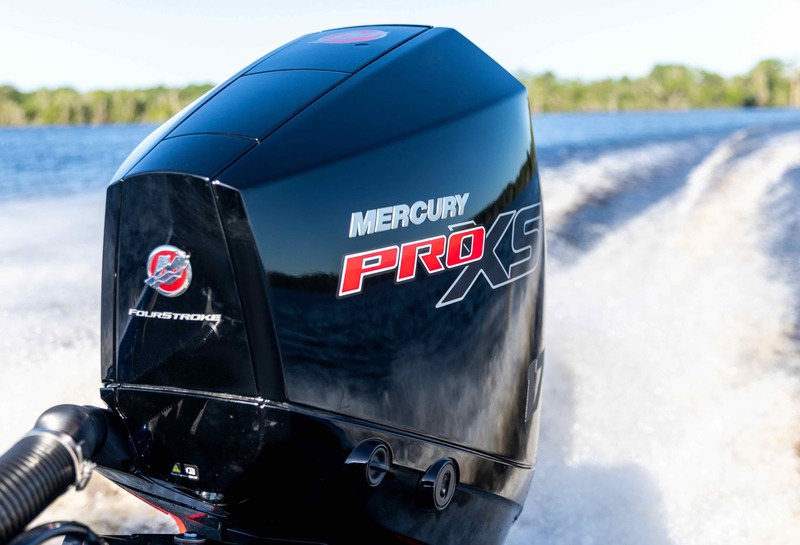 Mercury has announced the addition of multiple new Pro XS outboards – V-8 4.6L engines in 200, 225, 250 and 300hp, along with an all-new V-6 3.4L 175hp model. These powerful and precise new engines further expand Mercury’s already outstanding offering, representing the next generation of performance. “The unveiling of these powerful, high-horsepower Pro XS models is the culmination of a process we began in 2016 to comprehensively elevate the entire Pro XS brand with engineering that delivers higher performance, better fuel economy, uncompromising reliability and durability in a light-weight four-stroke design,” said John Buelow, Mercury Marine Vice President of global category management. The new 200-300hp Pro XS models are built on Mercury’s new V-8 engine platform and boast a class-leading 4.6L powerhead that delivers phenomenal torque while weighing just 229 kilograms. During testing, the 250hp Pro XS set new standards for high performance, outpacing the leading competitor by 20% for 0-32 km/h (0-20 mph) acceleration under heavy load while also delivering up to 16% better fuel economy at cruise. The 200-300hp Pro XS models also feature a robust 3.2cm (1.25-inch) diameter prop shaft and are available with a next-generation Torque Master gearcase that offers a 1.75:1 gear ratio and low-water pickups on the nose-cone for added mounting and trimming flexibility. Producing a wonderful V-8 rumble at start-up, these engines then transform to be smooth and quiet at cruise. The new 175hp Pro XS model is built on the 3.4L V-6 platform that Mercury introduced at this year’s Miami International Boat Show, and which won the NMMA Innovation Award. To maintain the Pro XS hallmark of ultimate performance, Mercury engineered this large displacement engine to deliver higher maximum RPM at full throttle, while retaining the Mercury V-6 platform’s peerless light weight (213kgs for the 175hp Pro XS) and fuel economy. Digital or Mechanical Controls: Available for 200-300hp Pro XS models. Regular Unleaded (91 RON): Both V-8 and V-6 Pro XS engines deliver peak performance and reliability on regular unleaded fuel. Advanced Range Optimisation improves cruise-speed fuel efficiency by automatically adjusting fuel delivery so seamlessly the operator won’t feel or hear it. Idle Charge Battery-Management: When battery voltage is low, the engine will automatically increase idle RPM’s to boost the alternator output and recharge batteries to the proper level, protecting operators from draining their battery while trolling. Electronic Oil Level Sensor: Optional electronic oil level sensor automatically alerts operator to low oil level. Top Cowl Service Door simplifies routine maintenance by allowing easy oil checks and oil fills without removing the cowl. The Top Cowl Service Door also houses the latch release and a carrying handle. Adaptive Speed Control: Pro XS outboards automatically maintain a desired RPM, regardless of changes in load, resulting in increased throttle response and a “sportier” feel for the driver. Pro Black Accent Panel: personalise your Pro XS outboard with a factory-painted Pro Black accent panel. Made of thin and durable polycarbonate which adheres firmly to the cowl, the panel is available from your local Mercury Dealer for 175-300hp Pro XS models.